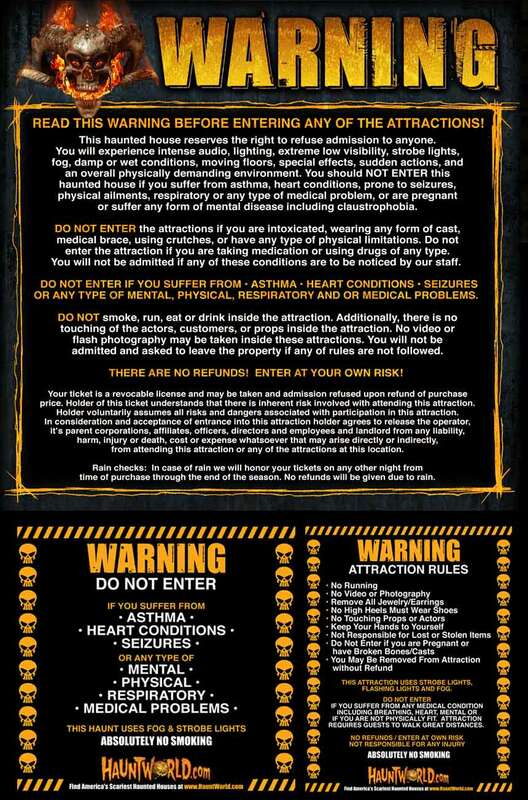 Read This Warning Before Entering Nightmare Dungeon Haunted Attraction! 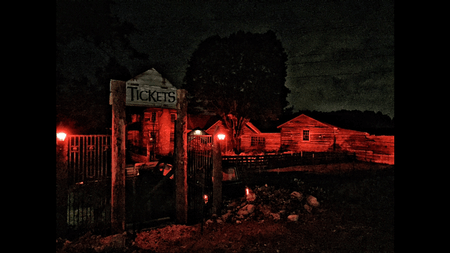 Nightmare Dungeon Haunted Attraction reserves the right to refuse admission to anyone. You will experience intense audio, extreme visibility, strobe lights, fog, damp or wet conditions, special effects, sudden actions, and an overall physically demanding environment. You should NOT ENTER this haunted house if you suffer from asthma, heart conditions, are prone to seizures, physical ailments, respiratory or any type of medical problem, or are pregnant or suffer any form of mental disease including claustrophobia. DO NOT ENTER Our attraction if you are intoxicated, wearing any form of cast, medical brace, using crutches, or have any type of physical limitations. Do not enter Our attraction if you are taking medication or using drugs of any type. You will not be admitted if our staff members observe any of these conditions. DO NOT ENTER IF YOU SUFFER FROM ASTHMA · HEART CONDITIONS · SEIZURES OR ANY TYPE OF MENTAL, PHYSICAL, RESPIRATORY AND/OR MEDICAL PROBLEMS. DO NOT smoke, run, eat, or drink inside the attraction. Additionally there is no touching of actors, customers, or props inside the attraction. No video or flash photography may be taken inside the attraction. You will not be admitted and asked to leave the property if any of these rules are not followed.